What could be better than french fries? 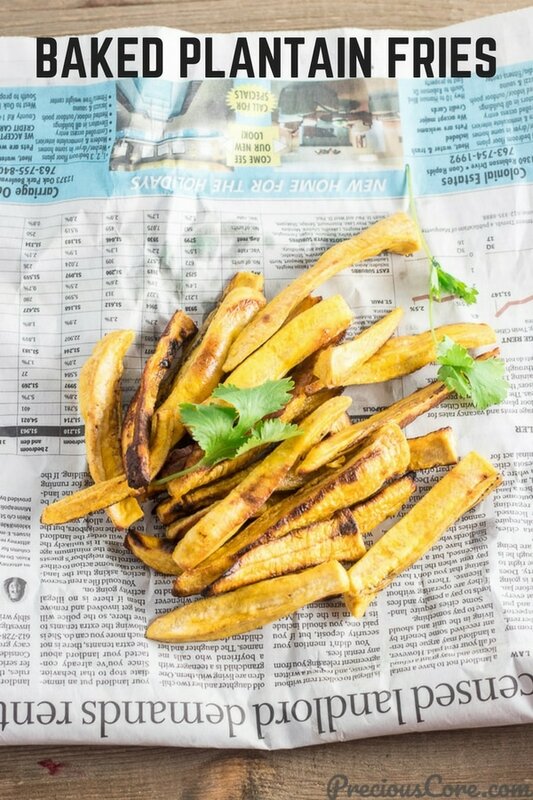 Plantain fries! Especially when they are baked and healthy. 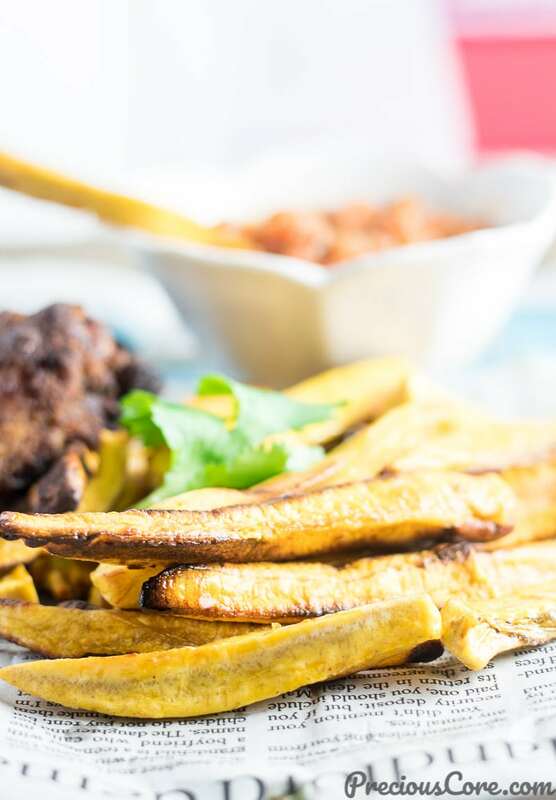 You guys, these plantain fries are sweet, crunchy on the outside, tender on the inside and the best part is you can enjoy them guilt-free because they are good for you. So make them! I love plantains! I heart plantains!! I adore plantains!!! It’s one of those things I always NEED in my kitchen because they are so versatile. 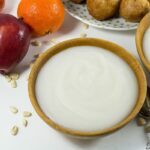 They can be boiled, fried, grilled, made into one pot meals, made into yummy snacks, enjoyed for breakfast, lunch or dinner! 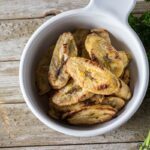 I already have a plethora of plantain recipes here on the blog and there are more to come because plantains are a superfood in my books! So what are plantains rich in? Plantains are rich in potassium and magnesium. They are also high in fiber, vitamins A, C and B-6. They help build the brain and boost immunity so if plantains are not yet a part of your diet, you better start eating them! These days, I have re-discovered plantains. 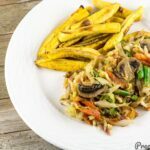 These days of my clean eating challenge, plantains have literally saved me! They work in almost every recipe that requires flour because they bind so well together. And though plantains are a starchy vegetable, they loaded with nutrients so it’s all good. So back to these plantain fries. They are my latest obsession as they are present in an embarrassing number of photos on my Instagram feed. 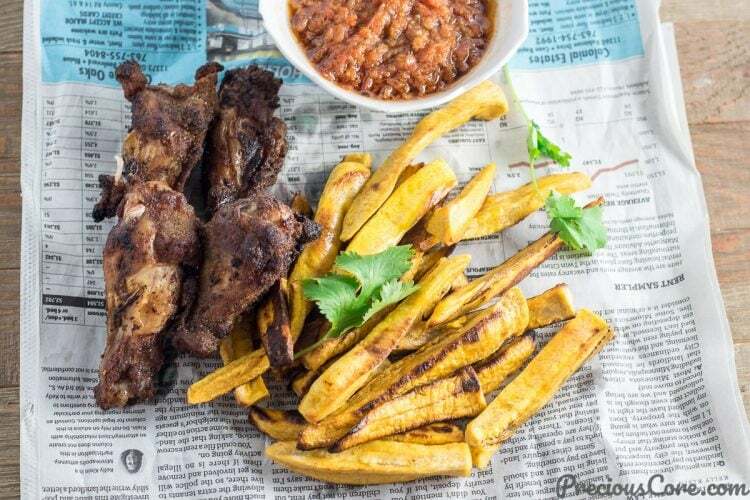 Truth be told, I could eat plantain fries every single day with different things on the side. There’s just something about the slightly sweet, savory, plantain-y taste they bring to my palate. The key here is to use plantains that are semi-ripe for the best texture and flavor. If your plantains are too ripe, they will turn out mushy. If they are unripe, they will be hard and the taste will miss that touch of sweetness. So semi-ripe is the route to go. 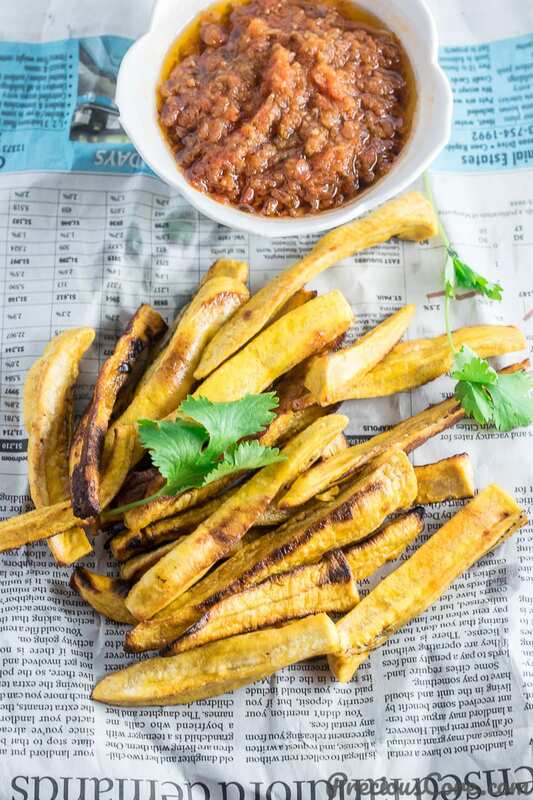 Semi-ripe plantains yield fries that are sufficiently crunchy. They are so yum! 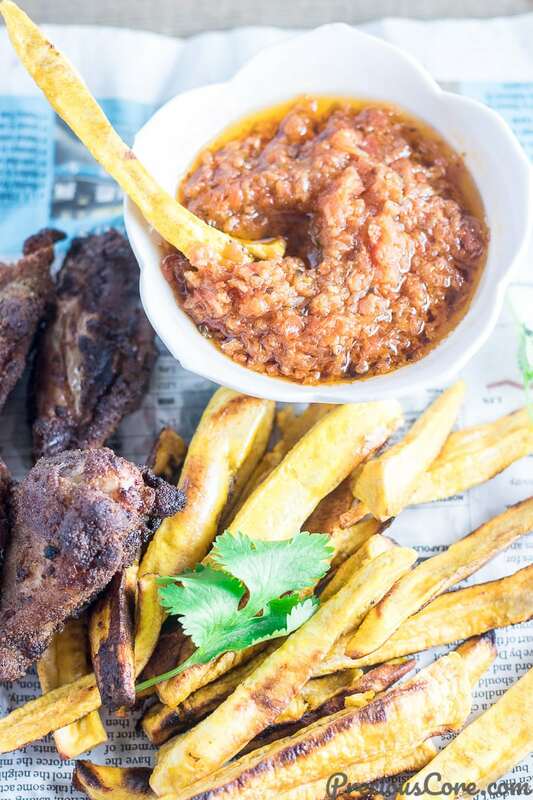 So go ye forth and enjoy all the plantain fries you can! 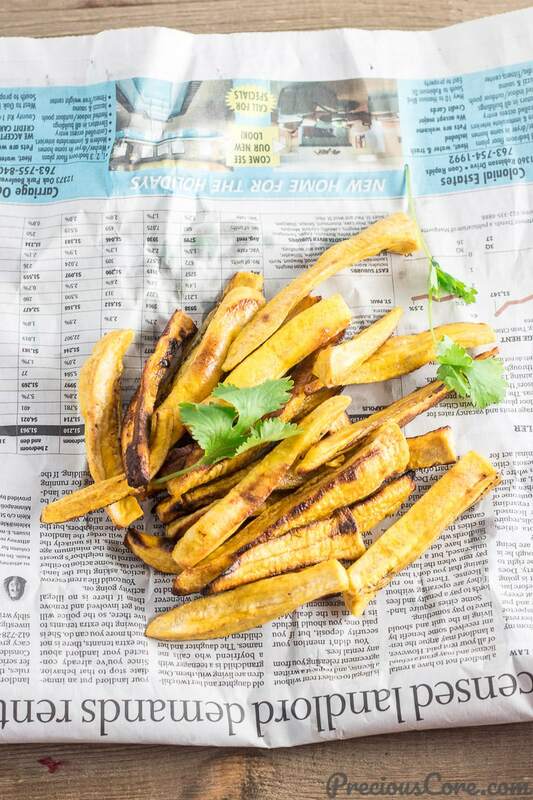 Baked plantain fries that are healthier and (I dare say) tastier than potato fries. 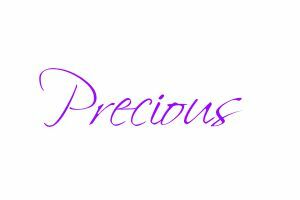 They are completely cooked in the oven, ready in no time, crunchy on the outside and tender on the outside. Place the plantains in a bowl. Add the oil and salt then toss to combine. 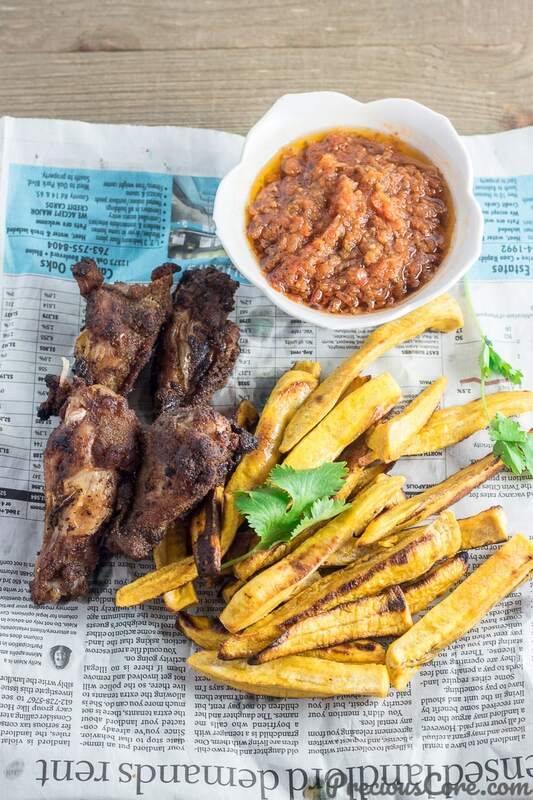 Place the plantain slices on a baking tray. Spread to ensure that they are all in a single layer. Place the plantains in preheated oven then bake for 20 minutes. Flip halfway through. 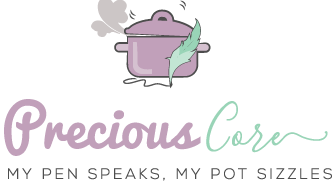 Serve warm with your favorite side or sauce! 1. The plantains I use here are ripe but not completely yellow. They are between green and yellow - this means they are slightly green and slightly yellow. I find that these are the kind of plantains that work best for baked plantain fries. They are crunchy enough with the perfect texture. 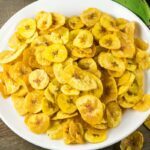 If you choose to use completely ripe plantains, note that they won't turn out crunchy. On the other hand, green (unripe) plantains might turn out too hard. So go with semi-ripe plantains. 2. 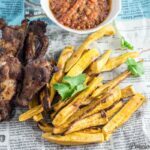 I find that these plantain fries are best eaten as soon as they are out of the oven. When they get cold, they become hard. 3. If you have leftovers, save them in a Ziploc bag and store in the fridge. Then you can reheat for about a minute in the microwave and enjoy. Your dreams were not meant to be achieved on normal terms. You were not made to be safe and comfortable. You were made to move mountains. You were made to conquer. You were made to overcome. You can move mountains. wow, I am definitely trying this out.